Renee Borg, sales manager for Acuity Brands Lighting, showed an efficient bay lighting system to Cheryl Fujiwara and Fred Nakama of HECO yesterday during the Seventh Biennial Efficient Electro-Technology Exposition and Conference at the Hawai'i Convention Center. Dean Masai was impressed by the number of new faces he saw at the Seventh Biennial Efficient Electro-Technology Exposition and Conference yesterday in Waikiki. In past years "this was a pretty small group, you kind of knew everybody," said Masai, an energy analyst for the state Department of Business, Economic Development and Tourism. It's obvious what brought a sold-out crowd of 600 engineers, building managers, contractors, architects and energy managers to the event yesterday at the Hawai'i Convention Center, Masai said. "The price of electricity has been going up because the price of electricity is tied to the price of oil," he said. "The biggest question everybody has is, 'How can I reduce my electric bill?'" 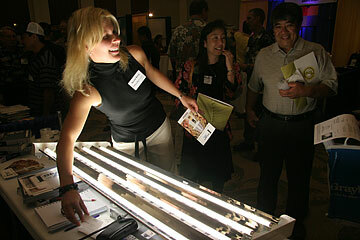 About 60 exhibitors at the Hawaiian Electric Co.-sponsored event displayed tools to do just that. Choices ranged from efficient light bulbs, photovoltaic panels and biofuel to sophisticated systems that control energy use in hotel rooms when guests are out. Richard Figliuzzi, president of Energy Management Group Inc., touted the features of two products his new company is selling: a 1-kilowatt wind turbine that can be mounted on a building and a high-efficiency photovoltaic system. The columnar wind turbine is compact, has few moving parts and does not kill birds as more familiar models do, Figliuzzi said. With the price of electricity so high, "everyone's looking for possible solutions," he said. Workshops included a presentation by internationally known solar expert Steven Strong on using photovoltaic panels in buildings -- both new designs and renovations. "The technology is proven, reliable, has a 25-year warranty and is ready to go," Strong said before showing photos of projects that prove solar energy does not have to be klunky or ugly. The photovoltaic panels that turn sunlight into electricity these days are thinner and more efficient than in the industry's infancy 30 years ago, he said. Builders can choose whether to display the use of solar energy or make it invisible, Strong said. "Electric glass" can even be made in a variety of colors beyond the standard dark blue, he said. The solar power industry is growing 40 to 45 percent per year worldwide, Strong said. With new federal tax credits taking effect this year, the interest in solar energy in the United States has boomed, said Strong, whose company Solar Design is consulting with HECO on retrofits of some of its buildings. Strong said there are buildings in cold climates like Massachusetts and New Hampshire that generate more than enough electricity for their needs. Hawaii, with a mild climate, plenty of sun, plus wind power, "should be the easiest place in the U.S., possibly on the planet," to make an energy-efficient building, Strong said. Once people get over the idea of paying upfront for photovoltaic systems, they will be amazed by the long-term savings, he said.